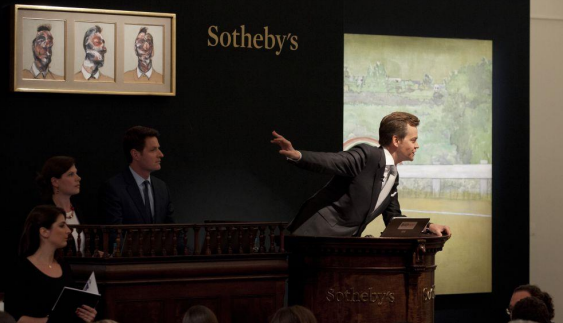 A major Francis Bacon triptych of his lover George Dyer sold for a landmark £26.7 million at Monday’s evening sale of contemporary art at Sotheby’s London. It was one of a number of works by British artists which helped push the sale past its high estimate to achieve £93.2 million. The sale generated strong interest from Asian bidders, who competed for works by Bacon, Warhol, Rothko, Ghenie and Varejão. “There was drama in the room tonight,” said Alex Branczik, head of contemporary art, Sotheby’s London. In total 86.4% sold by lot, with 88.2% of the sold lots achieving prices at or above their estimates. A new auction record was established for Peter Doig, when his Country-rock (wing mirror) sold for £8.4 million. The painting had been in the same collection since 1999, the year it was painted. Frank Auerbach’s Primrose Hill, Summer sold for a record £2,322,500 ($3,951,734) (est. £1/1.5 million, $1.7-2.5 million). This is many multiples of the £274,050 it sold for at auction in London in 2003.